Elvis Presley and Priscillaan American Love Story. Priscilla met Elvis during a highly emotional √ life changing √ time in Elvis’ life. Elvis had been drafted into the Army, was stationed in Germany, and had lost his Mother. Elvis was unsure as to what the future held for him (musically, professionally, personally, etc.) and he thought he had found his "soul mate" in Priscilla (even through she was only 14 when they met). Their relationship "blossomed" and Elvis made a verbal commitment to Priscilla when he was being discharged from the Army and heading back to the United States. Elvis missed Priscilla and even though his career "picked up where it left off" Graceland, and his life, were not the same. Elvis, being the Southern Gentleman and man he was, spoke with Priscilla’s Parents and got their permission for Priscilla to come to the United States (where she would finish her schooling) with the "promise" that he would marry her. 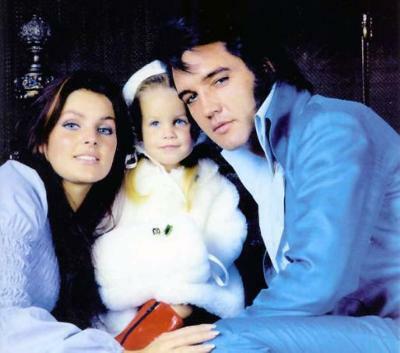 Elvis did marry Priscilla and 9 months to the day of their marriage Lisa Marie was born. During this time it seemed like Elvis was the happiest, performed some of his greatest vocally challenging music, and was the healthiest (i.e. mentally, physcially, etc.). The "68 Special" showcased this time in Elvis’ life for all to see. It has been written, and supported by Elvis closest friends, that Elvis was NOT fateful to Priscilla. Elvis also, it was stated, felt "differently" about Priscilla after she gave birth to their daughter (note: this was not uncommon for men raised in the South √ or elsewhere at the time √ but it is "no excuse"). Priscilla was a BEAUTIFUL, smart, witty, woman in the peak of her life raising her Daughter and having to share her husband with the Worldand with the Memphis Mafia. NO ONE could have known how that affected a marriageexcept her. Elvis and Priscilla divorced (offically) on October 9, 1973. Elvis, throughout his life, continued to love Priscilla even though he had successful relationships afterward (with Linda, in my opinion, being the "best" for Elvis). Priscilla deserves a LOT of credit/respect/appreciation from Elvis fans for ensuring that Graceland was kept "available" for his fans, for ensuring that Lisa Marie was financially stable when she turned 18, and (most of all) for being a WONDERFUL Mother. It is my opinion that Priscilla does not get enough "kudos" from Elvis fans for what she has done. There is no doubt that Priscilla has made mistakes and that there is "deep seeded resentment" from those who were Elvis friends about certain things she did √ and/or did not do. Priscilla has not "hidden" the fact that she keeps MANY things "private" about her relationship with Elvis and I respect/appreciate/admire her resolve. This book, Elvis and Me, is an interesting READ and it sheds light on their relationship and I am thankful that she wrote it. No book about Elvis will be"complete" as he was a very unique and multi-faceted man/entertainer. Thus every book, article, etc. should be taken in context as a "piece of a puzzle". Perhaps one day Priscilla, and/or Lisa, will pen the "ultimate intimate book" about Elvis. Until then "Elvis and Me" is a MUST READ for Elvis fans. Since it is not said enough "thank you Priscilla" for allowing Elvis’ fans to have options to recall their memoriesand to create new ones.